The new Torah study hall in Yeshiva Or Etzion includes a wireless internal network, electric outlets for laptops, and access to a Torah database. 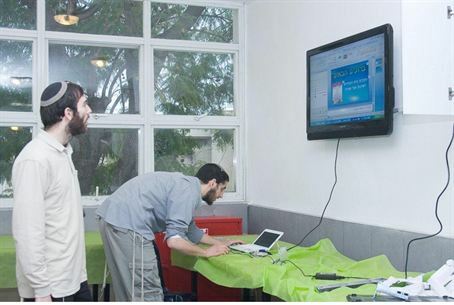 The new Torah study hall (Beit Medrash) in the Or Etzion Hesder Yeshiva was dedicated this week, replete with a wireless internal network, electric outlets for laptops at every table, and access to a digital database of Halachic and other Jewish texts. The yeshiva emphasizes that internet access is not provided in the Beit Medrash, of which a total overhaul has now been completed. The new Beit Medrash, called Heichal Yisrael, is sponsored by the Koshitzky family, as well as donations by thousands of the yeshiva’s graduates. The dedication was attended by Chief Rabbi Shlomo Amar, Mayor of Shafir Asher Abergil, Rabbi Asher Avidan of nearby Zrachiah, many students and former students, and of course Yeshiva Dean Rabbi Chaim Druckman.